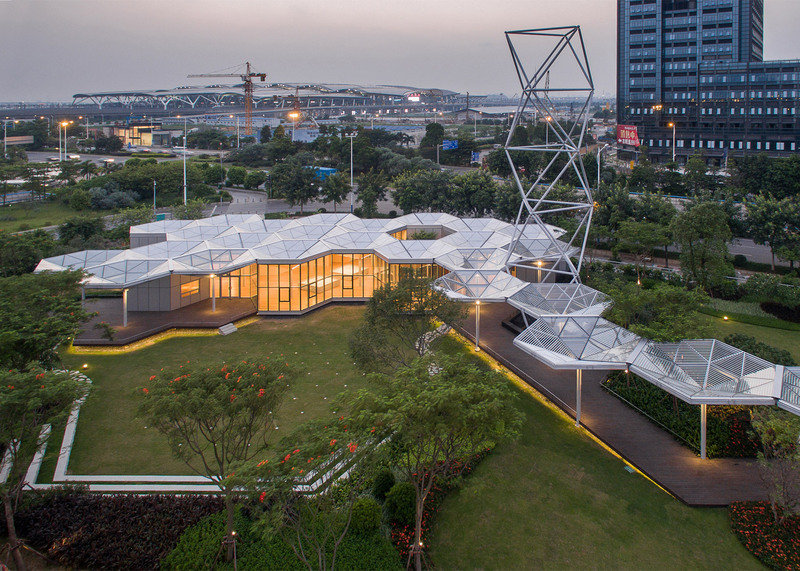 This showroom for a real estate developer in Guangzhou, China, is a prototype for a modular building system designed by Open Architecture to be easily moved or adapted (+ slideshow). 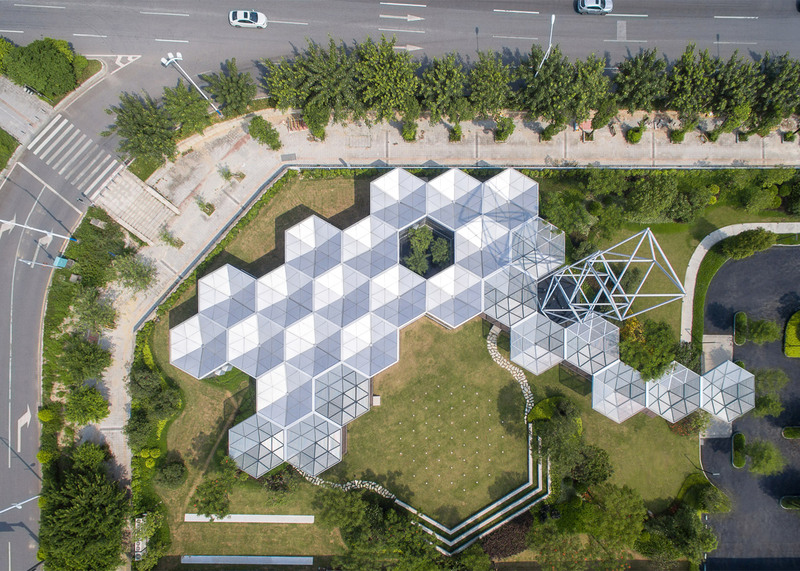 Beijing-based Open Architecture developed the HEX-SYS system in response to the proliferation of temporary structures erected by property developers during the country's recent construction boom. Typically used as sales offices and showrooms, these buildings are often scrapped when no longer required. 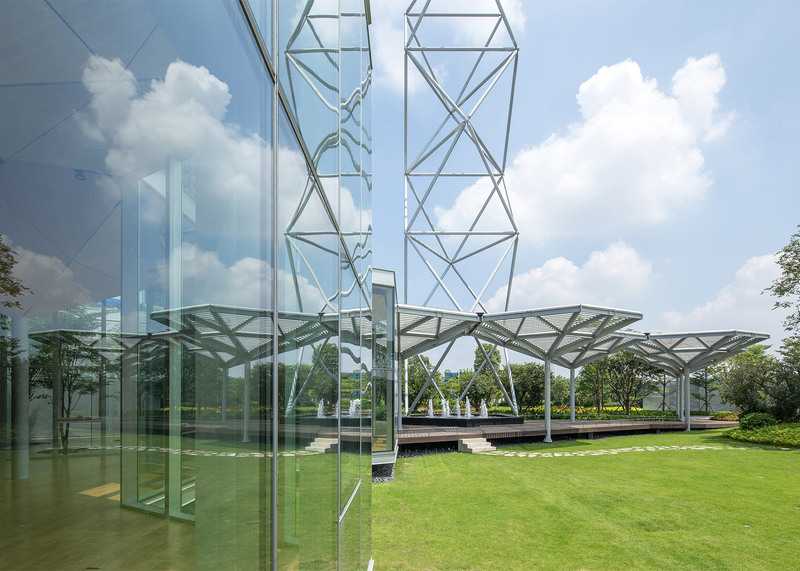 According to the firm – which previously designed a school in Beijing that merges with its landscaped gardens – the construction of these "standalone flamboyant but short-lived showroom buildings" results in a major waste of resources. 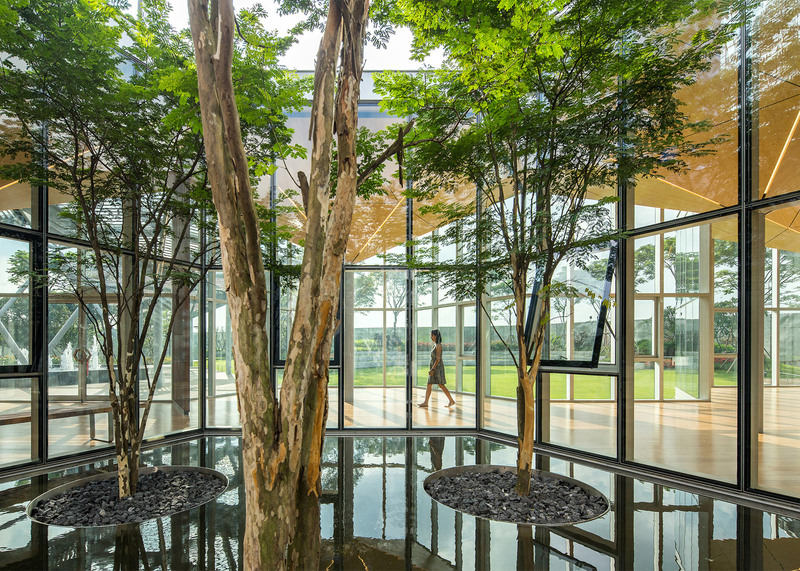 "We've been observing an interesting phenomenon here where many buildings have a very short lifespan," Li Hu, a founding partner at Open Architecture, told Dezeen. "One reason is that the land is not privately owned, which leads to uncertainty and often the buildings are demolished." 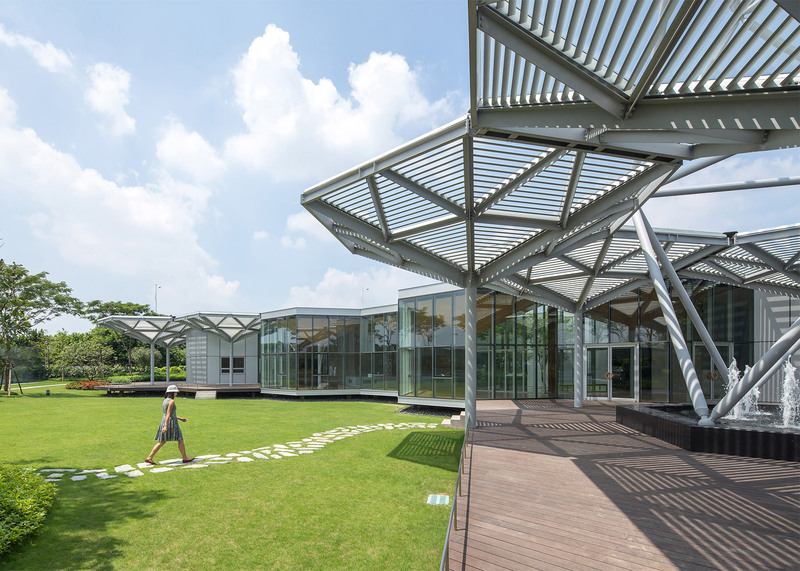 The 40-square-metre HEX-SYS modules feature a steel structure supporting roofs shaped like inverted umbrellas. 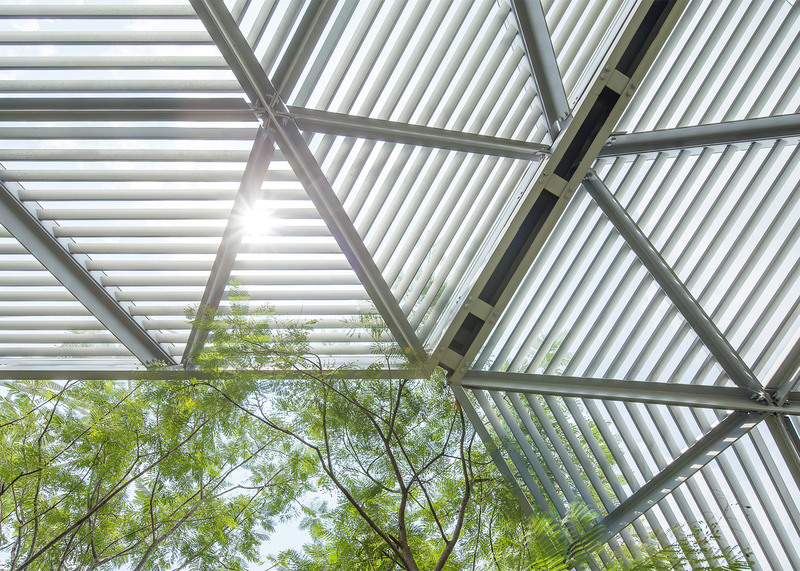 These are either solid aluminium panels or slatted screens that filter sunlight to create shaded outdoor spaces. 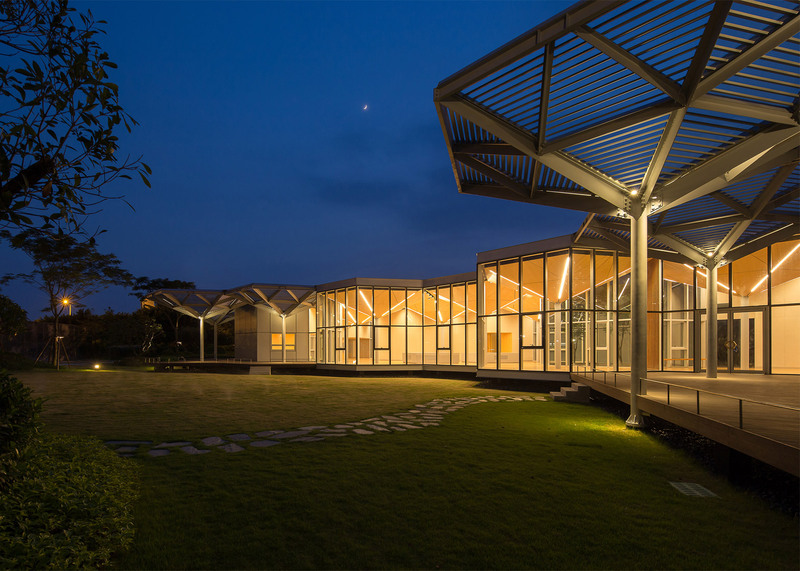 The enclosed modules are clad in either glass or anodised aluminium panels, and can be grouped together in limitless ways depending on the functional requirements of the project. 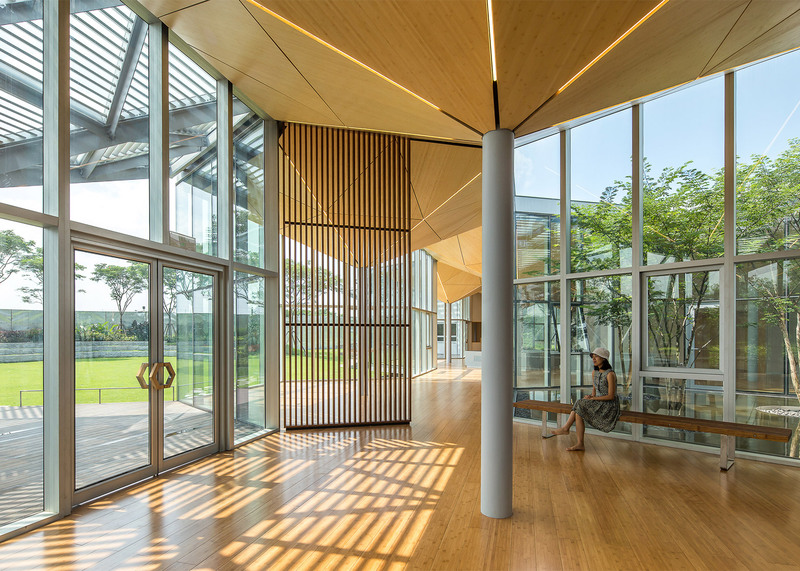 "What is interesting about this project is that the modular construction means that when you put it up again in a different site it can form a different configuration," Li added. "This gives it a further flexibility for its entire lifespan so theoretically it just goes on and on [being moved and reconfigured]." 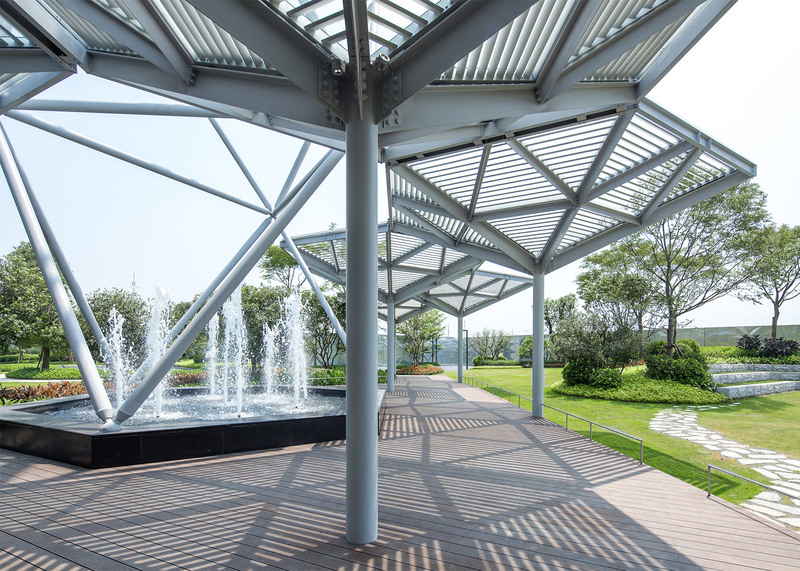 This prototype is located close to the new Guangzhou South Railway Station in an area that is undergoing significant redevelopment. 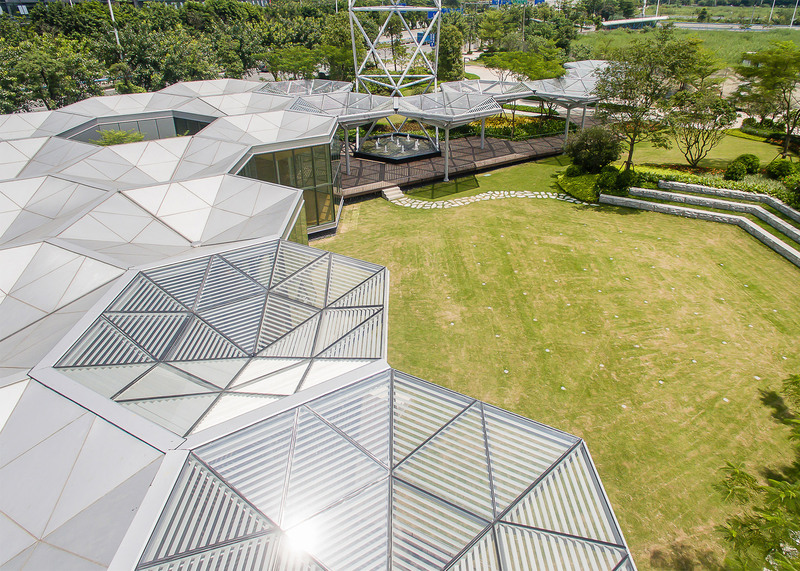 It was designed for real estate giant Vanke, which required a temporary facility containing offices, a presentation room, a lounge and a cafe for visitors. 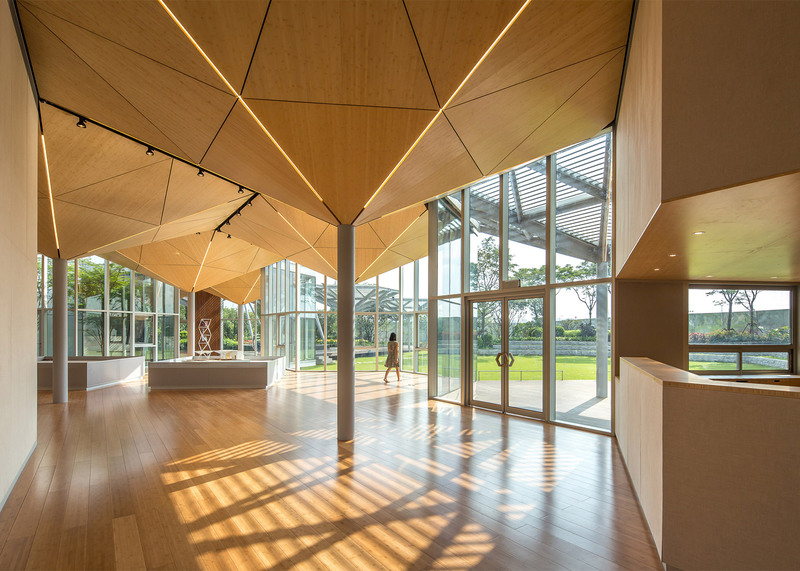 The architects were influenced by traditional Chinese buildings in which wooden joinery is used to enable the structures to be simply dismantled, moved and remounted elsewhere. Further inspiration came from the prefabricated buildings developed by 20th-century architects including Le Corbusier and Jean Prouve. 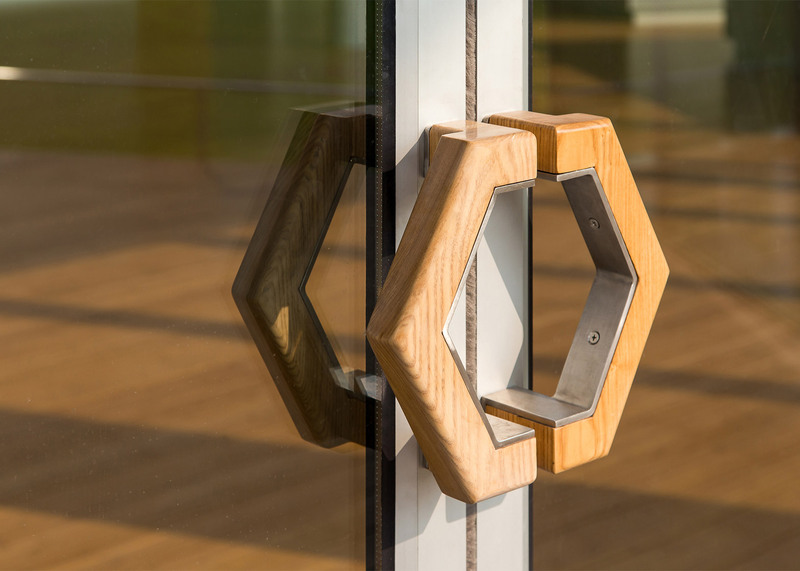 All of the building's components are fixed together without the need for glues or welding to make it easy to disassemble. Each of the hexagonal cells is mounted around a central pillar that contains a flue for directing rainwater to a tank so it can be reused to irrigate the surrounding landscaping and refill a small pond. 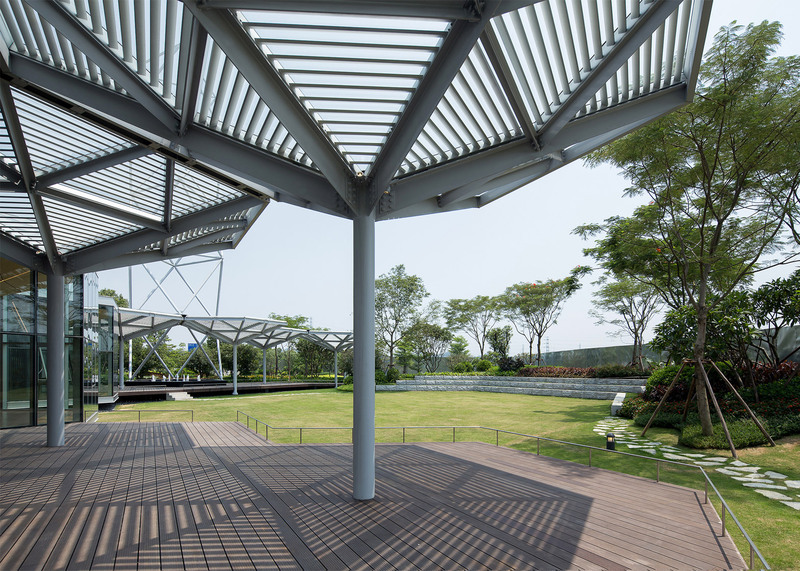 The pavilion is raised above the existing parkland on individual piles and the small amount of soil that was excavated is incorporated into the landscaping. A diagrid structure that rises above the building functions as a beacon that can be illuminated at night and is visible from the nearby train station. 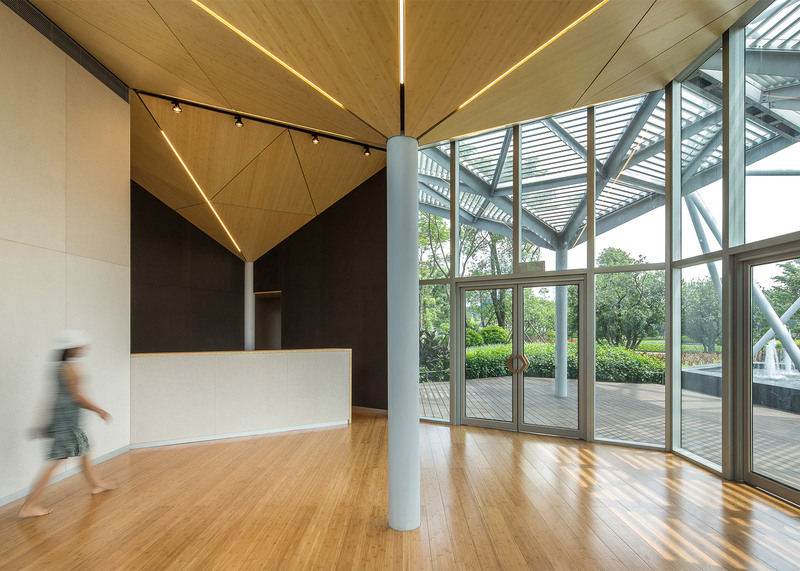 Bamboo plywood is used throughout the interior spaces because of its ecological properties and durability. 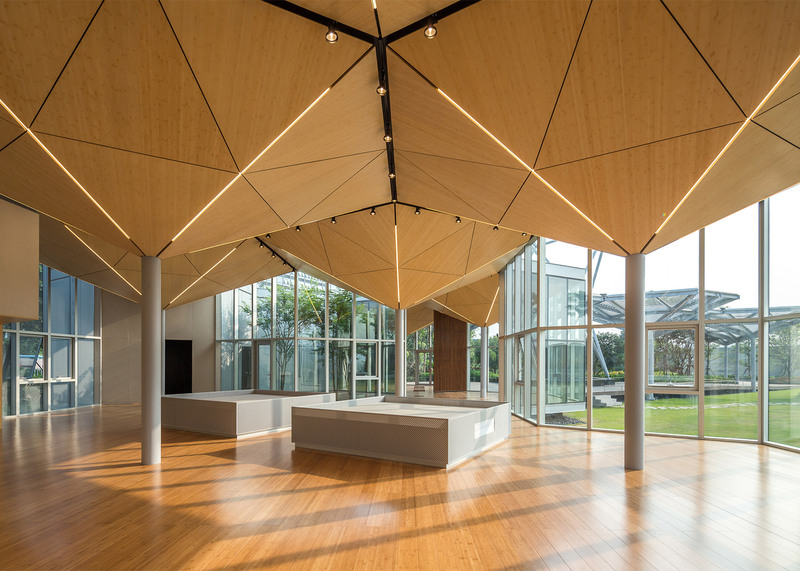 The prototypal pavilion demonstrates one possible application of the HEX-SYS system, but Li believes it could be used to provide offices, schools, shops, restaurants or any other single-storey structure. He is currently looking for partners to help develop the system so he can realise his ambition of promoting it like a product that can be ordered online, enabling anyone to combine units to suit their individual needs. "Most of the buildings in the world are not designed by architects," Li pointed out, "so we want to create a building block that means people have access to good buildings without hiring an architect."